Have you tried this fantastic devise? Makes the the perfect “First Devise” or Kindle for your littles, ages 3+. This tablet takes a beating and keeps on going. All my grandchildren currently use, or have used this devise. Even their parents can’t keep their hands off! Disc Golf truly is for everyone. Adults and kiddos of all abilities and the various physical shape can play and even compete. I coach 3-8th-grade kids for Fall and Spring Disc Golf. The beginning of the season is family oriented, then we move into tournaments, and finally championships for our region. This fun family sport is especially suited for people who are not inclined to play sports that require lots of running, jumping, and hitting. Go to USYDGA.com, for free, beginner instructional videos. Disc Golf is a portable, inexpensive, group, family, or individual game. All you need is a couple of discs and a course in the great outdoors. Most courses are free and open to the public. If you want a little more freedom to choose where you play, or you want to up your game you can purchase portable, folding baskets that you can take camping, to a yard party, or easily set up in your own backyard. Family game in the park with a portable basket. Check out these nice starter discs, and folding baskets so you can get out and have some good clean fun. I bought these baskets for my team practices and extra putting practice. We also use them in our regional tournaments because we need additional baskets to help with flow and timing due to the phenomenal growth of Disc Golf in our area. They are sturdy, durable, and easy to carry, unlike some of the all-metal types you can purchase at big, box stores. Live and learn. As a coach, parent, and disc golf enthusiast, I highly recommend these portable baskets. I love taking these beautiful baskets camping. They easily fold up like a camp chair and come with a nice canvas carrying case. Be prepared to be the most popular family at the campground. Other campers are curious about Disc Golf, some are even familiar with the game. It is quite the crowd pleaser at family gatherings and parties as well. Take these along and you will be a happy camper! My team doubled in size last season, so I requested a couple new baskets. My A.D. (Athletic Director) decided we should save a little money, so we bought the collapsible metal baskets at our local membership store. Big mistake. They are too heavy for my students to carry and they have to be partially disassembled. Now, we have to store them completely assembled because it is just too time-consuming and difficult to collapse them and reassemble for each practice. (My principle is not so thrilled since they have to be stored in the cafeteria.) Even worse, the chains get all tangled at every practice when we move the baskets out to the field. In the long run, we did not save anything, plus I am stuck with these behemoths. Uhg! Disc Golf basically follows ball-golf rules for scoring and typical play. In its early days, people called it Frisbee Golf or Folf, and threw flat rubber discs at bells, trees with targets, and bins while hiking through the park, forest, or mountain trails. Today, Disc Golf is a professional sport known for flying discs; a sport in which players throw thick plastic discs at targets or into metal chain baskets. You need a Putter, Mid-Range Driver, and Long Range Driver. That’s all folks! These sets are perfect for beginners and can grow with you as you build your throwing skills. If you would like to add some more individual discs to your equipment list, try these precision discs. There are a few rules to keep in mind when playing disc golf. SAFETY FIRST is the #1 RULE of the game. Discs are NOT Frisbees. Disc Golf discs are meant for throwing at a designated target and not for catching in any way, shape, or form. Severe damage to face, head, hands, body, etc, could occur if a player tries to catch a disc or if a person is in the pathway of a disc. Always stand at least 10′ behind the thrower when watching or waiting. Wait for everyone on your team to finish throwing before retrieving your disc. Never throw discs up in the air or at people, or objects that are not your target. Always pay attention to other throwers around you. Yell “FORE! !” if your disc heads toward a person. If you hear someone yell “FORE! !”… DO NOT TURN and LOOK in that direction…always DUCK and COVER. Sportsmanship and honor are RULE #2. Wait for each other. Quietly and patiently respect a player’s turn and those waiting for you. Leave the area as nice as or better than you found it. Respect nature. Applaud for other players. If you find a disc that isn’t yours, try to return it to the owner. I found this to be an interesting aspect of disc golf. Respect and honor are expected. Most players write their name and phone number on their discs with the expectation that a fellow player will call to arrange how to return the disc. Some players will set a lost and found disc at the beginning of the course in case the owner returns to look for it. I have seen discs waiting for their owners for more than a week at courses in the woods as well as developed parks. I have also had the joyous experience of someone calling me because they found my “lost” disc. Except for the ones that have flown into the river, I have had my discs returned. Just recently, a friend of mine and I were playing at a very rugged site. He threw his disc about 300 feet into the trees and bushes. We searched but couldn’t find it. As we walked to the next TEE-pad, I discovered Mark’s disc; it had flown considerably past where we were looking. Suddenly, a kid swooped down out of nowhere and grabbed the disc. We tried to persuade the kid to return the disc. Thankfully, Mark’s name was still readable on the underside of his black, Axiom driver. Finally, the kid succumbed to good sportsmanship. Labeling black equipment can be challenging. I use this permanent marker to label black equipment such as bags, discs, and bins. 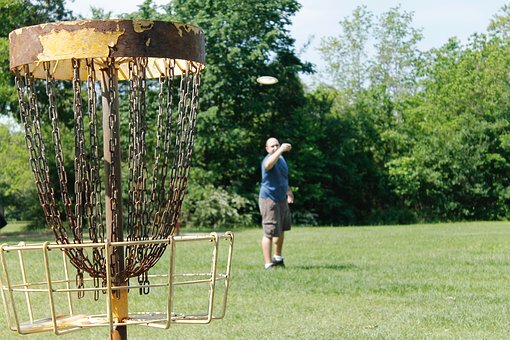 Toss out any preconceived ideas you may have about Disc Golf and give it a try. Enjoy a great time outdoors with your friends, family, or alone. I would love to hear about your disc golf experiences, so please feel free to drop me a line in the contact tab. Remember, It’s NOT a Frisbee!